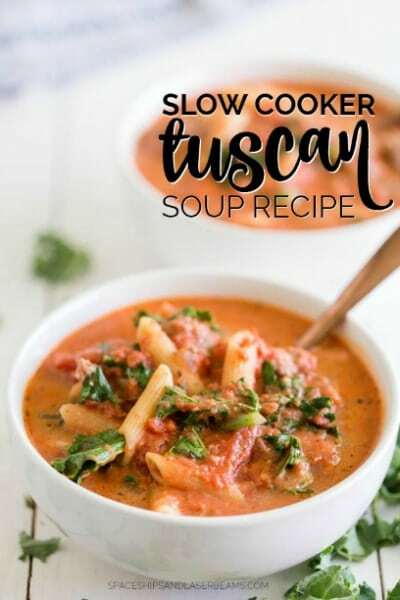 Slow Cooker Tuscan Soup is a delicious and hearty homemade meal that is so simple to make in your crock pot! 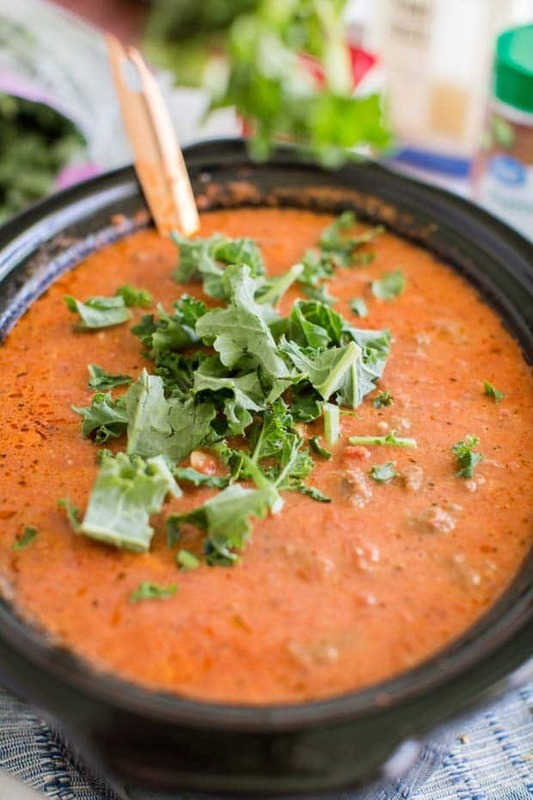 This amazing, yummy soup is made with sausage and cheese and comes together so quick and easy thanks to your slow cooker! It’s absolutely delicious and the colors are beautiful, too. Packed with hearty tomatoes and spices, the flavor of this hearty homemade soup is amazing. 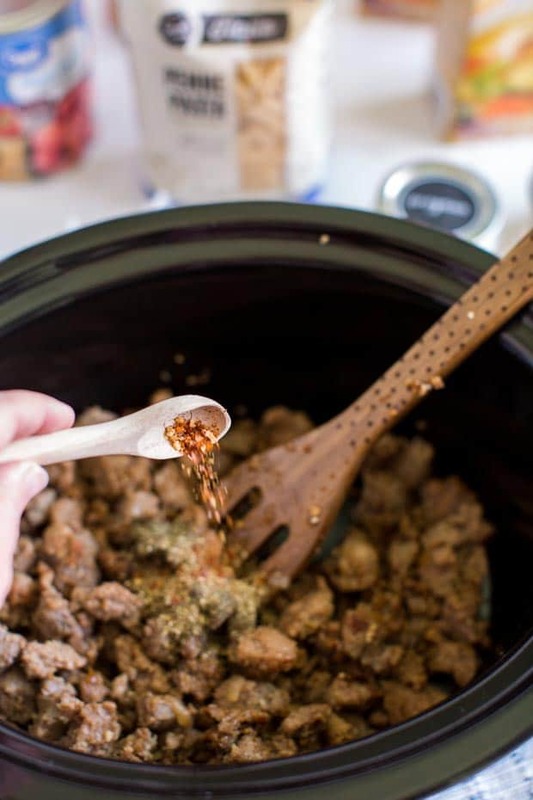 It takes only a few minutes to combine the ingredients in your crock pot, then simmer on low. Your family will love this meal made with love from scratch. And you’ll love how simple it is! 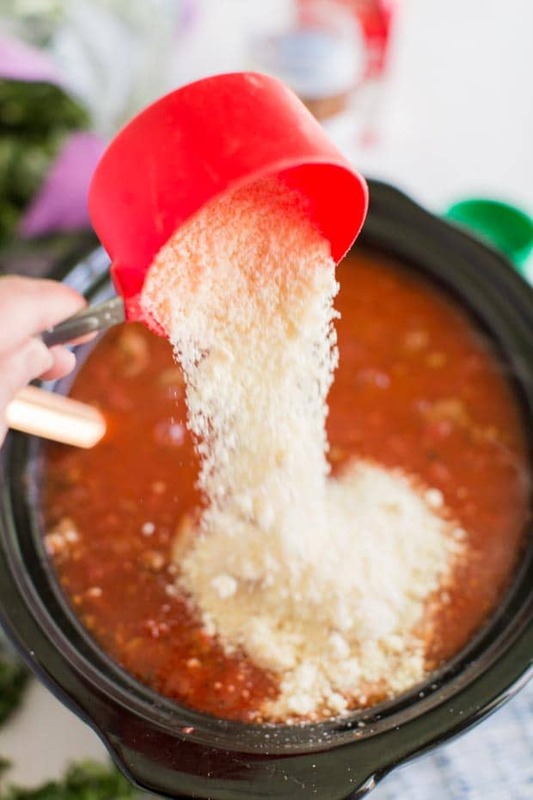 Grab the ingredients and let’s get started making this amazing slow cooker Tuscan soup. Serve with lots of cheese and a loaf of fresh, crusty bread and you’ll have a dinner worth raving about. Our home is filled with lots of laughter… and lots of food. With three active boys, there is an endless supply of both under my roof. And never a dull moment. And I’m so thankful for it. We spend a lot of time together in the kitchen and gathered around the dining table. My three busy bear cubs put away so.much.food. It doesn’t seem possible how much they consume. Where do they put it all!? Because of this, I’m always trying out new easy recipes that will fill them up. Until snack time. Which starts five minutes after the dishes are done. But I digress. Today, I’m sharing a soup recipe that we all enjoy year round — you make it with sausage, cheese and lots of love — and it comes together easily in the slow cooker. Plus, it’s bright and colorful. Easy, beautiful, delicious… the stuff my dreams are made of. The best! If you love slow cooker recipes, make sure you check out my crockpot chili as well. This post is sponsored by Walmart and SheKnows Media. Like I said, we spend a lot of time in our kitchen and dining room. There are dance parties in the kitchen during meal prep and dishes. These always start with enthusiastic games of “rock, paper scissors” to determine who gets to decide the playlist for our dance party. Gathered at the dining table, there are conversations about our days, what we’re thankful for, what was hard… and inevitably, a fart joke winds itself in. These are memories that are precious and dear to me. I try to capture each moment and commit it to memory for always. Because my boys love food — and so does mama — there’s always a debate about what to have for each meal. I want a wholesome, yummy meal that doesn’t require me slaving away that everyone will love. Kind of a tall order. 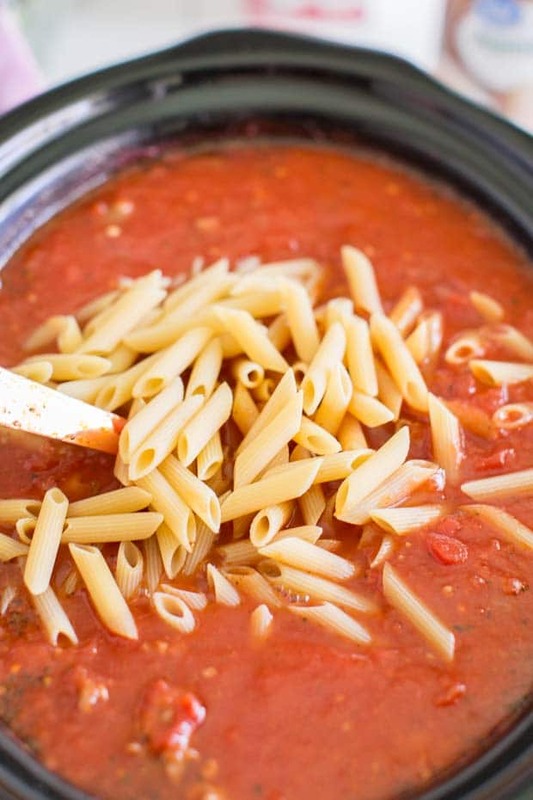 Enter this slow cooker Tuscan soup! Making soup in a slow cooker is such a simple way to get dinner on the table without a lot of fuss. 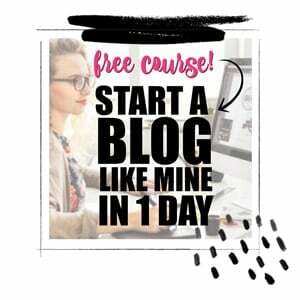 I can bring it together earlier in the day and then skip the usual busy hassle that ensues at dinnertime. Genius. Because my boys are big eaters, I’m used to creating hearty soups for a crowd. I don’t know how to cook small. And I suppose it’s not just soups, I love trying out new, hearty slow cooker meals in general. Because of the aforementioned easy thing — I’m all about simplifying life wherever possible. And it’s not just a slow cooker soup for fall. I like making this recipe year round. I also think it’s genius to use the slow cooker during the warmer months so the stove isn’t heating up the house. So let’s talk about this Tuscan soup recipe. I think it’s one of the best slow cooker soups I’ve tired, so I’m excited to share it with you! I do a lot of my shopping at Walmart because they carry brands I love, all in one easy stop. 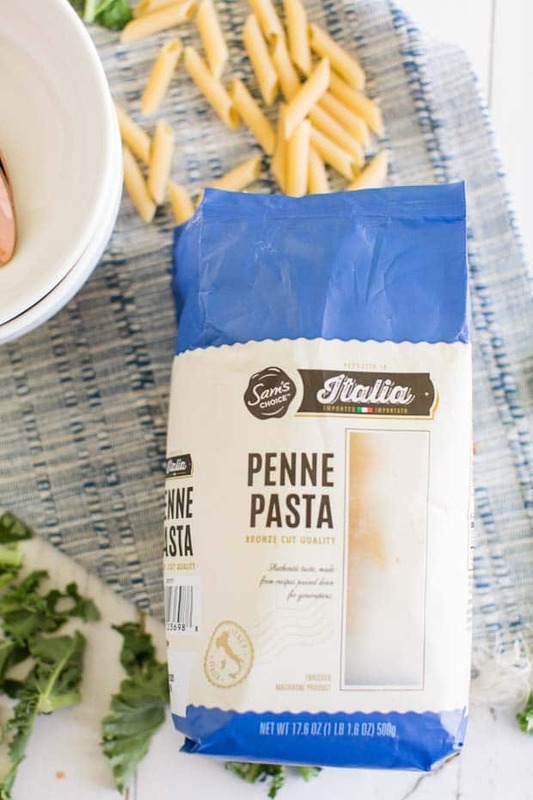 Speaking of brands I love, Walmart has a great selection of Sam’s Choice Italia products that are hand-crafted in Italy just for Walmart. 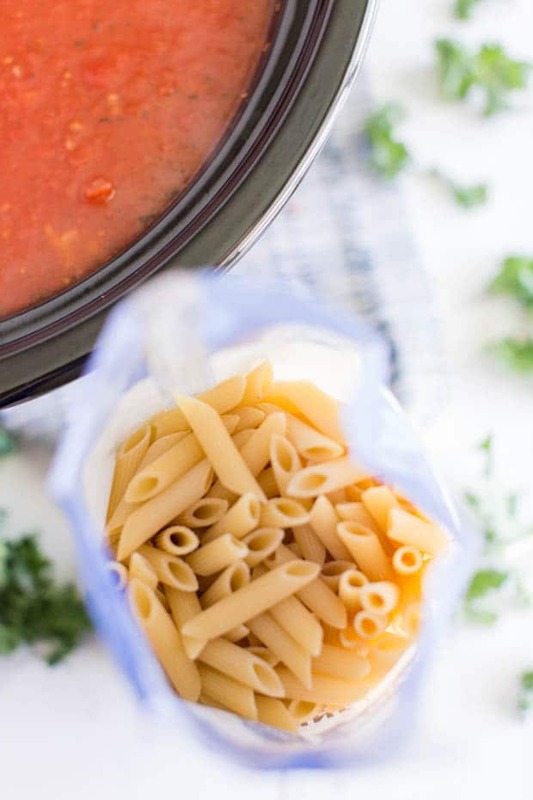 The collection includes delicious sauces like tomato basil and pesto, easy meal kits, frozen pizza and more. For this recipe I used the penne pasta, but there are a ton of other delicious varieties too! 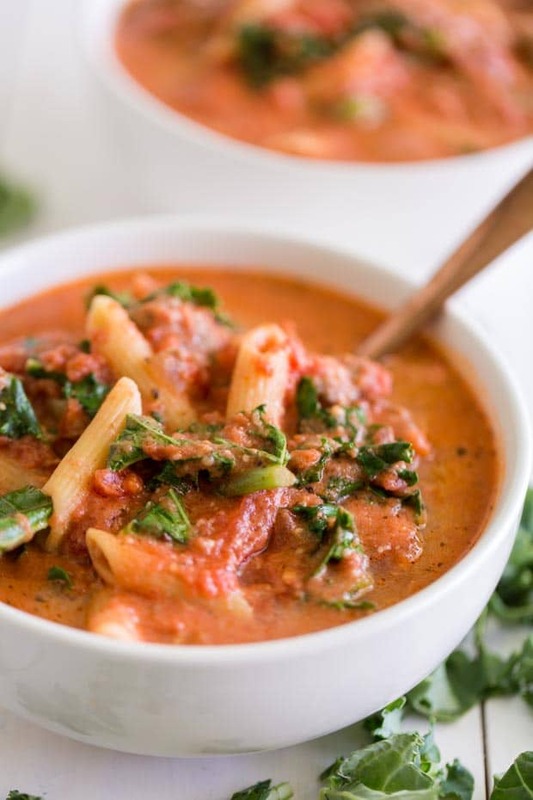 You’ll want crushed tomatoes, chicken broth, an onion, sweet or spicy Italian sausage, garlic, dried basil, dried oregano, salt, crushed red pepper flakes, black pepper, kale, heavy cream, Parmesan cheese and penne pasta. You could also add beans, if that’s your thing. I usually make it without — but that’s a personal preference/taste thing. I know some folks really love beans in their soup. This is a meal that takes me only a few minutes to prep and get into the slow cooker earlier in the day, leaving me free for the rest of the day, with dinner ready to go when it’s time. To start, you’ll grab a large pan and add sausage, onion and garlic. Roughly chop with a spoon while the sausage is cooking and cook over medium-high heat until the sausage is completely cooked through, about 8-10 minutes. Once the sausage is cooked, remove it from the heat and drain the excess grease, if you desire. In a 6 quart slow cooker add the chicken broth, crushed tomatoes, cooked sausage and all of the seasonings. Add the lid onto the slow cooker and cook on high for 2-3 hours or low 4-5 hours. Add heavy cream, shredded Parmesan cheese and penne pasta and cook for another 20 minutes. Then add chopped kale and cook another 10 minutes. Once cooked, serve and garnish with more cheese if you like. Look at the beautiful, rich color! And your house will smell amazing from the soup simmering in the slow cooker all day. 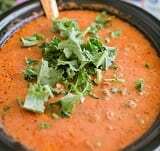 I think we eat with our eyes and nose before our taste buds and this soup does a great job of that. Serve with a loaf of fresh, crusty bread and a slab of butter for a meal that everyone will want seconds of. And maybe even thirds if they’re like my eaters. I hope you enjoy this Slow Cooker Tuscan Soup with your family soon! Psst, I think your family will love this chicken pasta as well. This delicious, cheesy, hearty soup comes together beautifully in the slow cooker! In a large pan add sausage, onion and garlic. Roughly chop while the sausage is cooking and cook over medium-high heat until the sausage is completely cooked through, about 8-10 minutes. Once sausage is cooked remove from heat and drain excess grease, if you desire. In a 6 qt. slow cooker add chicken broth, crushed tomatoes, cooked sausage and all of the seasonings. Add lid onto slow cooker and cook on high for 2-3 hours or low 4-5. Add heavy cream, shredded parmesan cheese and penne and cook for another 20 minutes. Once cooked, serve and garnish with more cheese if you so desire. 1 result found. Use up and down arrow keys to navigate. 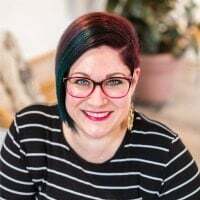 Previous Post: « Mom is the Life Of The Party – Celebrate Her This Mother’s Day! It made so much I couldn’t fit it in my crock pot so I divided it into two pots and cooked it on the stove! Mine turned out really thick. Was it supposed to be?